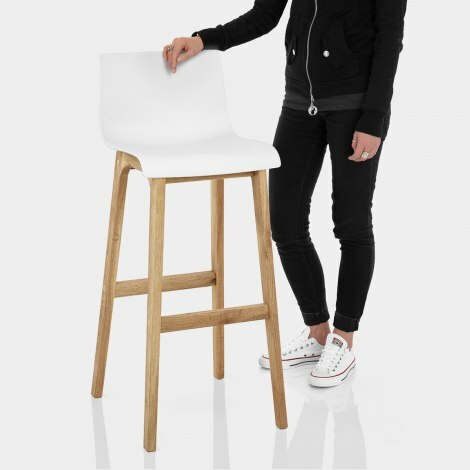 Embodying a combined set of retro and contemporary traits, the Drift Oak and White Bar Stool is a versatile design that is sure to have an unforgettable impact on your bar area. Sure enough, your guests will love the simplistic yet striking appearance that the Drift radiates. Gracefully curved to create a medium height backrest, the white matt resin seat has a modern design that contours the body for secure comfort when seated. Fixed at kitchen bar height, a solid oak frame provides a contrast to the matt resin seat, exuding organic beauty and strength through its smooth, bentwood edges. Stability is ensured through the sturdy footrest, which completes the four-legged frame. "Fantastic quality product, lovely design"
Ordered one afternoon & delivered by 11am the next day, super impressed with service & quality! They are lovely bar stools, great quality and so easy to wipe clean. Sturdy and comfy! Highly recommend! Stools were exactly as I hoped - stylish, good quality at an excellent price. Was worried about whether the plastic seats would look cheap but not at all...very practical for young children. Wouldn’t hesitate to recommend. Next day free delivery was an added bonus! Easy to construct, well made for the price and comfy too for a hard material seat. Look great too, simple and classic. Fantastic service arrived within 24 hours of ordering. A great addition to our kitchen, they are stylish and sturdy, easy to keep clean. Very happy with our purchase. The stools look great. After seeing many overpriced stools and many awful second hand ones I was thrilled when I found these. Thanks!